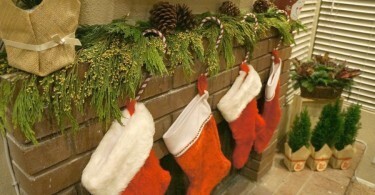 I have partnered with Glade® to share some of my favorite Christmas decorating ideas for the home. I received some of their holiday candles and fragrances and I honestly love how it all turned out! Eeekk, we are so excited for Christmas around here! MJ has been begging me to decorate since mid-November. I told him to wait until Thanksgiving was over: It’s finally time! Looking for some holiday cheer at home? 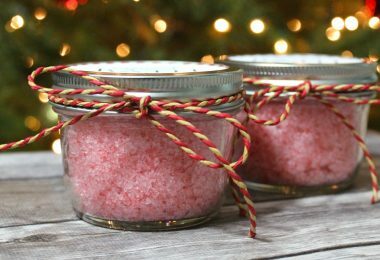 These Christmas decorating ideas will help you spruce up your home for the holidays without breaking the bank: just DIY it! 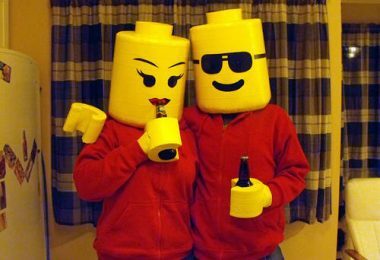 We always have company during the holidays, so it’s a must that we dress up this often overlooked area of the home: the guest bathroom. Since we always host Christmas dinner at our house, I decided to give our guest bathroom a holiday worthy make over. I used Glade® candles and fragrances, fresh greenery, holiday ornaments, and other accents in Christmas colors to create this, no huge amounts of cash required! 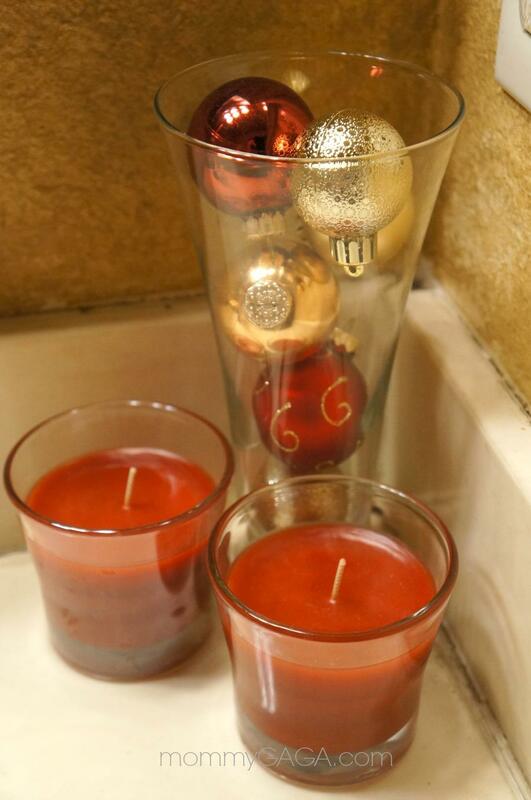 The Glade® Limited Edition Winter Collection was the perfect addition to my holiday decor. They have a bunch of lovely fragrances that are reminiscent of the holidays: Apple Cinnamon Cheer™, Sparkling Spruce™, Frosted Berry Kiss, and Pure Vanilla Joy. Since the bathroom is one of those places that everyone uses, it’s only right to give it a fragrance that will delight our guests. One of our favorite Christmas decorating ideas is the color scheme. We decided to decorate with reds, whites and golds, with hints of green. 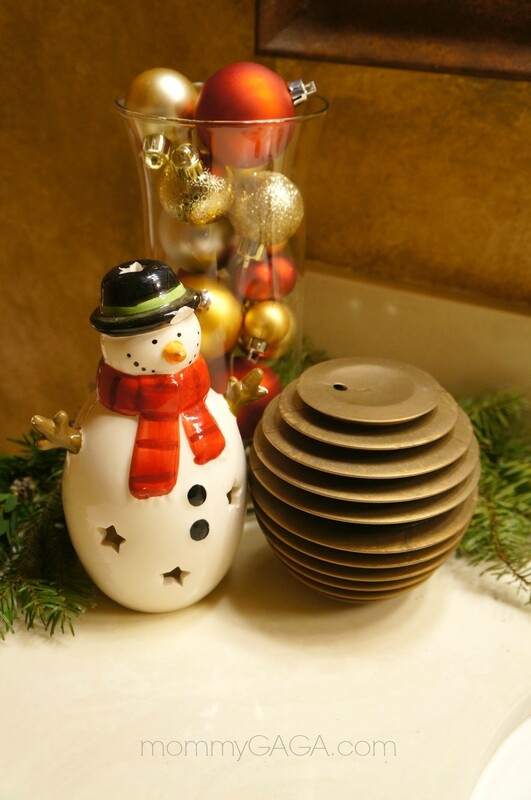 For the bathroom counter, we grabbed a cylinder vase and stacked a few of our holiday ornaments inside. The bronze Glade® Sense & Spray Automatic freshener already looks like a home decor item, the new 360° design blends in so well without looking like an air freshener. It senses when you pass it, spraying a burst of fragrance into the air. It is refillable, and since it only sprays when it senses someone, it lasts about a month. We found a cute ceramic snowman and placed it in front of the ornament vase, next to the Glade Sense & Spray Automatic freshener. The other side of the bathroom counter got a similar treatment to match. I made a smaller ornament vase and placed two Glade Apple Cinnamon Cheer candles in front. I love how candles look in decor, these red ones look pretty elegant in their glass jars, they were perfect! One side was adorned with fresh Christmas tree greens, I grabbed a few scraps from our local tree farm and placed them behind each ornament vase. 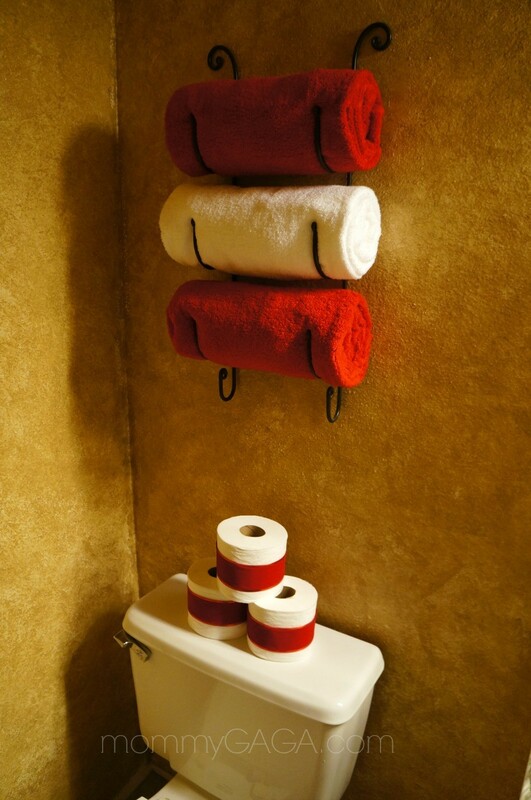 We replaced our usual towels on the towel rack above the toilet with festive red and white ones. If you do not have a towel rack, a wreath would look nice in this space as well. The ribbon wrapped toilet paper makes a nice touch; I love how it spruces up the not so exciting part of the bathroom, the toilet! Just grab your favorite toilet paper and some red velvet ribbon, measure enough to fit the roll, overlapping a little. Line it up with the seam of the toilet paper roll and use a glue gun to adhere together in that spot. 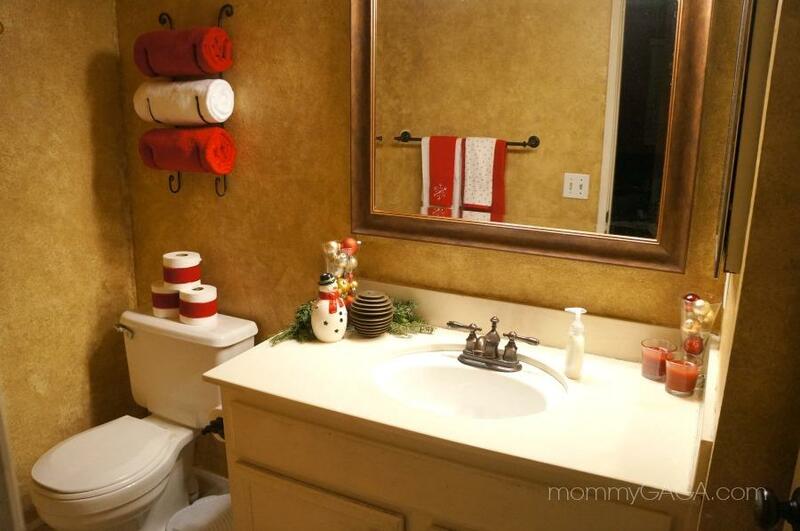 Also, be sure to swap out the towels on your towel bar with some Christmas themed ones that match your display! 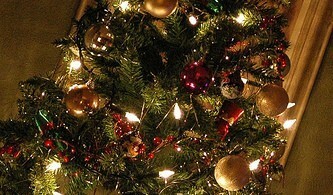 Hope you like these Christmas decorating ideas! Great ideas, even small touches make a huge difference.